We're pleased to be able to offer online access to this reference work from Brill. A print copy remains available in the reference collection at: REF BS680.G57 D53 1999. 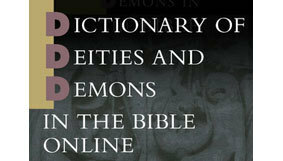 "The Dictionary of Deities and Demons in the Bible contains academic articles on the named gods, angels, and demons in the books of the Hebrew Bible, Septuagint and Apocrypha, as well as the New Testament and patristic literature. This online version contains the second extensively revised edition." PTS Alumni can access DDD from the Welcome, PTS Alumni! page.